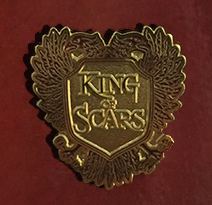 King of Scars - Free Gift Offer! The first in an intricate, fantasy duology from #1 New York Times bestselling author Bardugo, set in her familiar "Grishaverse." After his country's bloody civil war, young king Nikolai Lantsov must find a way to top a rising threat to the once-great Grisha Army. Yet every day, a dark magic within him grows stronger, threatening to destroy all he has built. Order Now and recieve a FREE Enamel Pin! Get a pin when you pick up your book at the store, or we can include it with your mail-order shipment. Former bookseller Ev chose this first in the "GrishaVerse" trilogy as a Staff Pick! While her handwritten review has been lost to the ages, Ev's taste is unparalelled. See for yourself by reading all of Ev's available staff reviews in the Archives section.